mnml ssgs: ssgs take tokyo! just a quick post to say thank you to everyone who helped make the 1st ever MNML SSGS at dommune last night a big success. thanks to the dommune crew for having us, to yuri for organising so much of it, craig (c_olvrin) and dasha for playing great music, to all those who came, and to everyone who tuned in during the night. 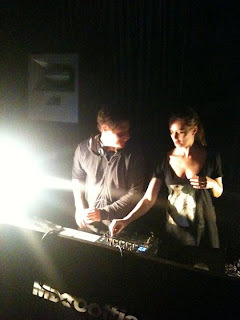 there was a great atmosphere at dommune; a really warm, friendly vibe. we had a lot of fun. and about 20,000 people checked the broadcast at some stage during the night, peaking with a constant 1700-2000 viewers for dasha's set. to be honest, it was all very last minute & pretty stressful, but i'm really glad we did it. no way it wouldn't have happened without the support of our friends and fellow ssgs. so thanks! most of our readers should know dasha, but you can hear more of her music on her soundcloud and myspace. i also strongly suggest checking c_olvrin, he is doing some great stuff. here is a live recording of him warming up for PvH in tokyo earlier this year at mariana. watching dasha play early in the morning while at work was lots of fun :) she played a twisted new track by dino sabatini to end her set... good stuff.